Targeted for children 10 and under with their caregivers, Kidspace Children’s Museum provides a space for creative and interactive learning. Exhibits and programs encourage children's growth and development through explorations of natural environments, investigations in science, and artistic forms of expression that captivate the inquisitive and growing minds of children. Most of the museum is outdoors, so be ready for active and messy play. Change of clothes, water shoes, and a towel are recommended. If you are visiting with an early learner age 3 and under, please remember that adults must wear socks in the Early Childhood Learning Center, and shoes are required in all other areas of the museum for everyone's safety. 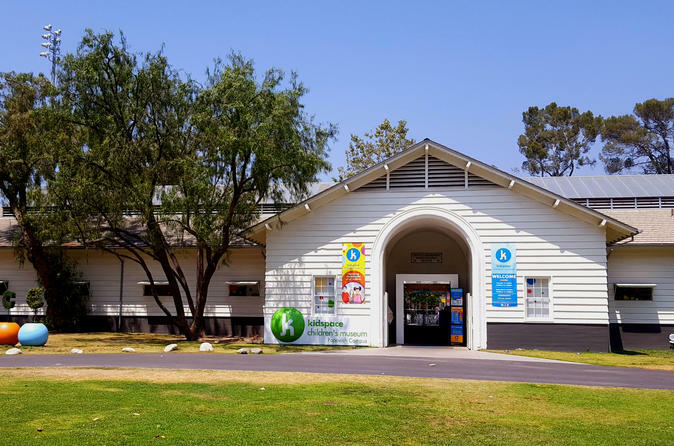 One of Southern California's premier family destinations, Kidspace Children's Museum is located on 3.5 acres in Pasadena, CA, with more than 40 hands-on exhibits, as well as daily interactive activities and programs. The mission of Kidspace is to nurture the potential of all children through kid-driven experiences, inspiring them to become joyful, active learners. Beverages, healthy family meals, snacks, and desserts are also served at an onsite cafe. Outdoor seating and high chairs are available. Visitors are also welcome to bring in their own food and beverage (glass bottles and containers are prohibited). During your stay also visit the Busy Bee Learning Store which features fun and educational products that enhance the Kidspace experience. Themes include dinosaur, science & engineering, garden, early learner, active & dramatic play, bugs, and arts & crafts. There is a wide selection of book titles and games to inspire curious minds.